Description: Information Store (3932) First Storage Group: An attempt to move the file “E:\Program Files\Exchsrvr\mdbdata\E00.log” to “E:\Program Files\Exchsrvr\mdbdata\E000080A.log” failed with system error 2 (0×00000002): “The system cannot find the file specified.” The move file operation will fail with error -1811 (0xfffff8ed). Error 1811 is related with JET_errFileNotFound. The reason behind this issue may be a wrong signature and L Generation which pop up in an Exchange log file(E00.log). If E00.log file has a signature which matches incorrectly, then the information will not store on the database even if the database is reconciled. Sometimes anti-virus software deletes the orphan or lost Exchange log files from the server. This error 9175 on Exchange server can be resolved by checking the anti-virus programs and configured them as they can not scan the Exchange server directories. Also, check the log files of the anti-virus program and verify that Exchange server’s log file was quarantined or deleted. Recover the log files from the folder which contains production files. If other Exchange log files are not lost then Run the Exchange Information Store Service. If you found that lots of missing log files then go to the quarantine folder and check over there for the lost files. If you can not find the files follow the next step. Move all the consistent database files to the backup folder. If new E00.log file has been generated then move it to the backup folder. Also, move the E00.chk and make a copy of all existing files. Now restore all the database from the backup. 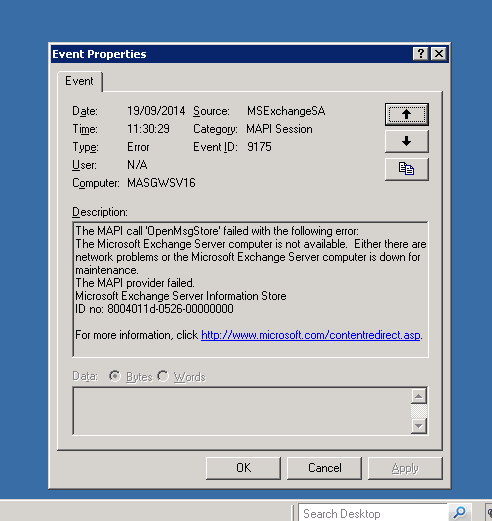 Well described manual solution to resolve the error event ID 9175 and 486 in Exchange Server. If a user is unable to sort out the issue after the mention solution then they can choose our Exchange Recovery Tool. The Software is the best approach to resolve any type Exchange Database files errors.